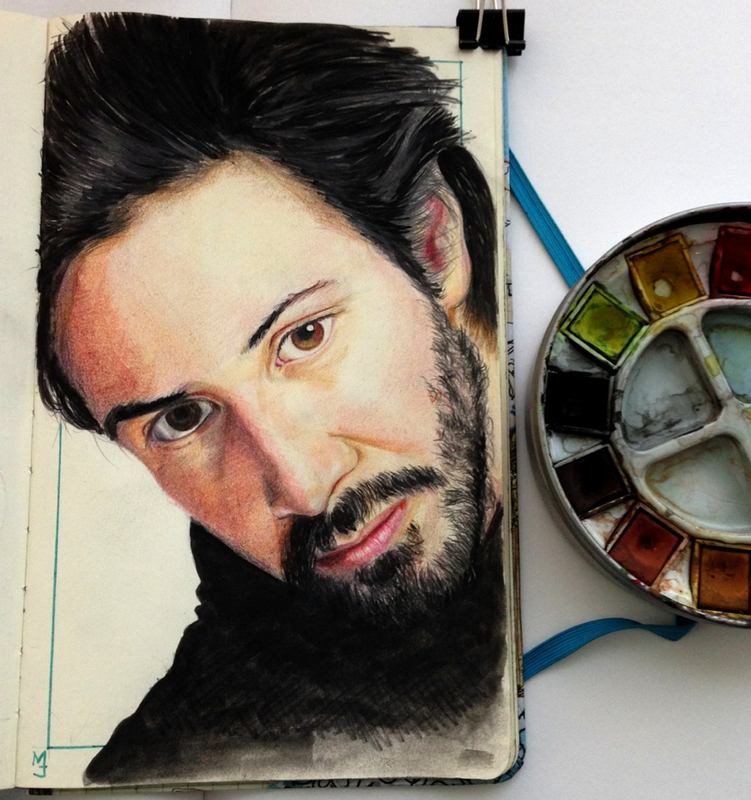 Although I had seen him in other movies before, I really noticed Keanu Reeves after seeing the movie The Matrix, in which he was the lead actor. It's one of these movies that really made an impact on my perspective on life in general and created a paradigm shift. He's an interesting person, who doesn't appear to be very public. I couldn't find any official social media accounts from him. He doesn't even have a personal website. Still, from bits of interviews it seems like he's a very down to earth and hard working man who loves the movie industry. He has a lot of movies under his belt, both as an actor and also, more recently, as a producer. He also has a book called Ode to Happiness, which is described as a picture book for grown-ups. It looks like he is collaborating with the same illustrator in another book about Shadows, due to be released later this year in October. I took a couple pictures as I was drawing his portrait. After getting a comment on Instagram about "teaching" how I colour my portraits, I figured I would share my process a little more in case it might help or inspire others. I usually start with a pencil, check the proportions and fade the lines before I start adding colours with a kneaded eraser. (I never realized how useful this little tool is until I recently started using it). Then, sometimes, I add a quick wash with watercolour to add more depth and locate the shadows. Then I start using watercolour pencils. I start with the eyes (usually my favourite place to start) and expand from there. I look for the many colour that make up the face. After following a couple artists who are expert in portrait, I quickly realized that there are many layers and colours involved in drawing a realistic portrait. 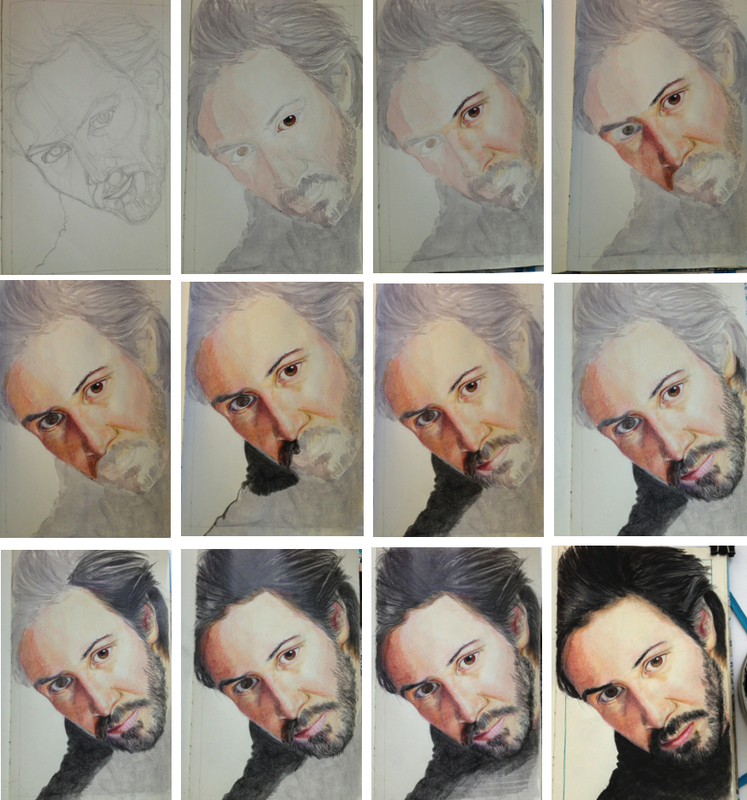 So for me, part of the process is finding out how many colours make up each area of the face. It's a bit like looking for individual pixels on a screen. I tend to go back over a couple times to add more contrast and correct the shadows and colours. Then I go back to watercolour with a brush mostly to intensify the black and finish up by dipping some watercolour pencils in water to intensify some details.